The iPad Generation is very susceptible to screen damage. Please select this repair if you have cracked or broken your screen. 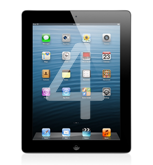 This repair includes a brand new original Glass screen replacement for your new iPad. Select this repair if there are no cracks on the screen but the display is not working correctly. This repair is for a replacement LCD screen which generates the image (not the top Glass screen). This repair will include a new LCD screen and a new Glass Touchscreen. It's a complete replacement of the screen. This repair is for an bottom iPad dock connector replacement module (lightning connector). Please select this repair if your iPad is no longer syncing or charging. This repair is for the cleaning of liquid damage on your iPad. We will strip down the iPad and manually clean the components with special solution, and then dry it out. We will then thoroughly test the iPad to make sure it's all working as intended. This repair will include changing board components, but excludes the LCD screen if it's damaged. Not sure of the problem with your iPad 4 - book it in for an inspection and send it in for us to diagnose and respond. Our engineers will check your handset and then we'll send you a quote via email.